Above are photos of the blades on the Secura SP7412, the flat burr of the SCG-903B and the conical burr (the only real one) on the Secura CBG-018. 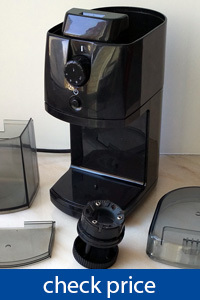 Can you see the “teeth” (nubs) on the burr disk of the Secura SCG-903 Automatic Electric Coffee Mill (in the middle)? They do most of the work, mashing the coffee beans instead of gently milling them. As you can see on the photos from under the microscope, this affects not only the consistency and uniformity of particles, but also their shape and minimum possible size. Is the difference between conical burrs and the “fake” burrs (like on the Secura SCG-903B) so noticeable in terms of taste and aroma? Or is it indistinguishable? Should you overpay for a burr grinder or are blades OK for espresso? 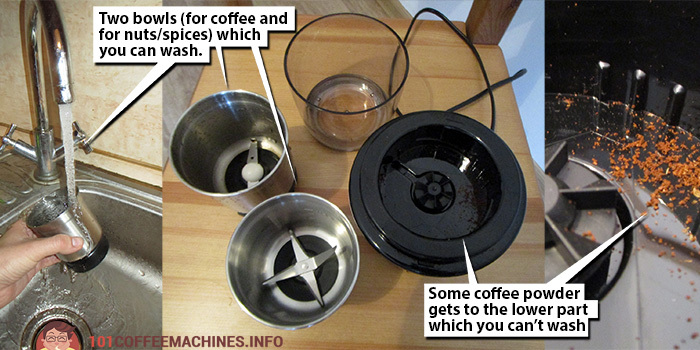 Which one should be chosen as an entry-level grinder for a home espresso maker? How loud are they? Shape and Size of Ground Particles and How Does It Affect the Taste? I chose three models made by one popular brand (Secura) to demonstrate the difference between three types of coffee grinder: blades, fake burrs and conical burrs. Most of my conclusions can be easily generalised to any electric grinder with a similar construction. Moreover, there are exact clones of these Secura grinders both on the US market and in Europe (all three grinder models are OEM manufactured, which means that Secura only prints their labels on existing products from third-party factories). There are definitely the distinctions between different real burr types (conical or flat) and even between different conical burr grinders. However, they are less distinguishable. And deep analysis of burr coffee grinders would be the topic of my next review. In this one I simply want to show how different low-end grinders could be. Then you can be sure to purchase a coffee grinder of the appropriate type: blades, fake burrs or real burrs. A uniform grind is important for the taste of the coffee, regardless of the brewing method: espresso machine, moka pot, drip brewers, pour-over cones or Chemex. 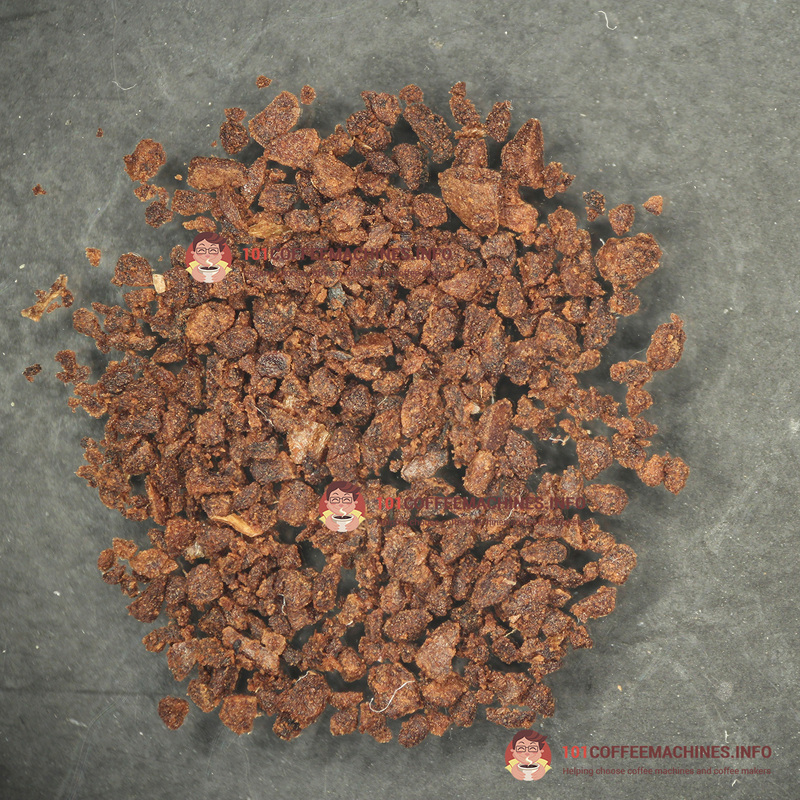 If the particles are uneven in size, the bigger chunks would give a sour taste (under extracted) and the small ones a bitter taste (over extracted). In other words, it is harder to control the taste of your coffee. It’s like trying to boil both big and small potatoes in one pan – you will end up with them being either undercooked or overcooked on your plate. Potatoes should be cut into equal-sized pieces to avoid this. The same should be done with coffee beans. This factor is especially important for alternative coffee brewing when a coarse or extra-coarse grind level is needed – it’s usually much harder to get a uniform coarse grind on any type of grinder. In the case of a fine or extra-fine grind (for Turkish coffee), it’s much easier to achieve uniformity. Therefore, even the cheapest blade grinder would be enough (in terms of uniformity) for a Turkish coffee pot. The shape of the particles also plays a role. If the shape is similar to a sphere (rather than a cube), they have a larger surface area and hence the extraction is better – the hot water takes much more taste and aroma out of such a grind. 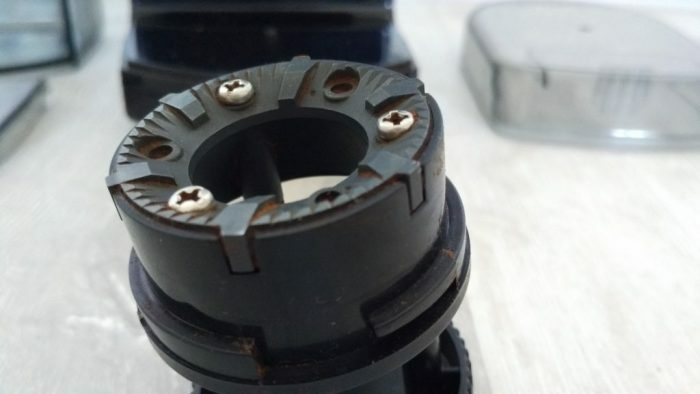 The shape is more important for espresso makers, because it’s much easier to tamp soft, homogeneous and fine coffee powder with the right particle shape. And correct tamping is a key factor for espresso. 2. Keeping that in mind let’s look at the coffee under the microscope. In all the cases I made the finest grind possible. Very uneven. 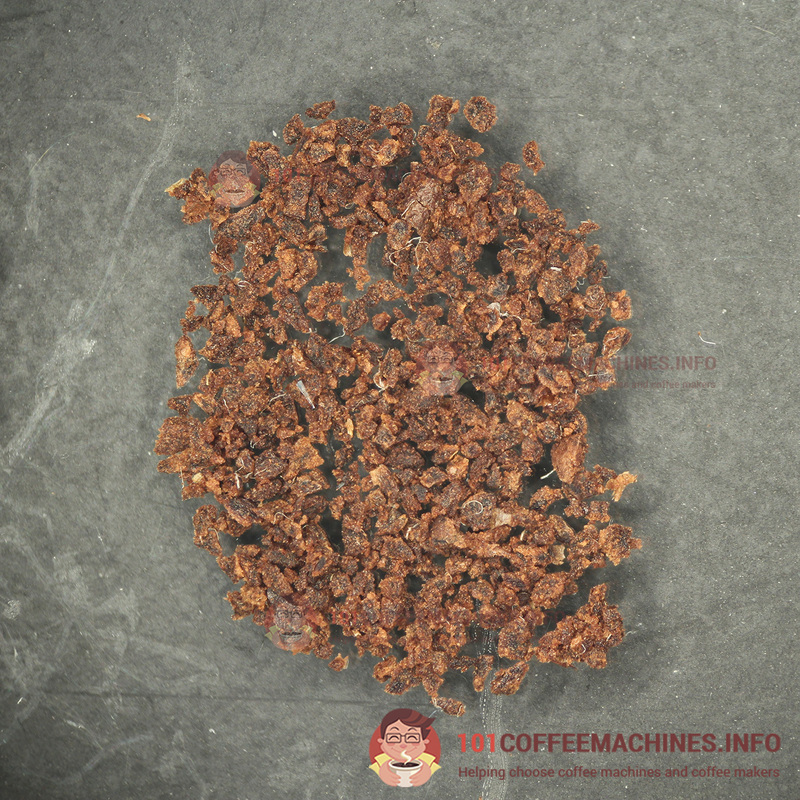 Moreover, I would say that it is rather a good result for blade coffee grinder. On ordinary blade grinders, you will get even less uniform particles. The secret of Secura SP7412 is special winglets on the end of the blades, like on the airplane’s wing, here they are more efficient than on many cheaper models and they really help to achieve a bit more homogeneity… which is still far away from being called ‘suitable’ 🙁 I wouldn’t say ‘throw it away’ as some coffee snobs would. For undemanding coffee drinker, it could be OK for moka pot for example. Looks like early Picasso’s work, huh? We can clearly see that particles have cubical shape, that’s the result of blades cutting and smashing coffee bean, not grinding it. 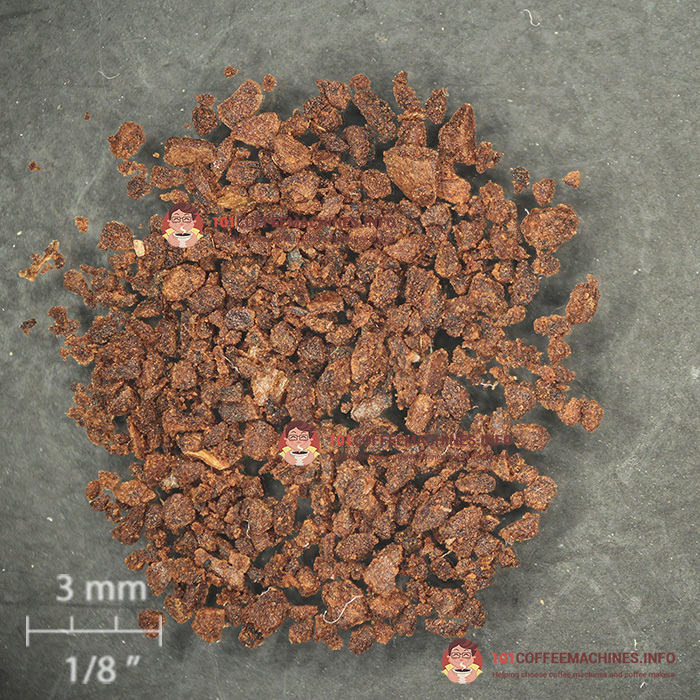 Such shape has a small surface which results in low extraction. 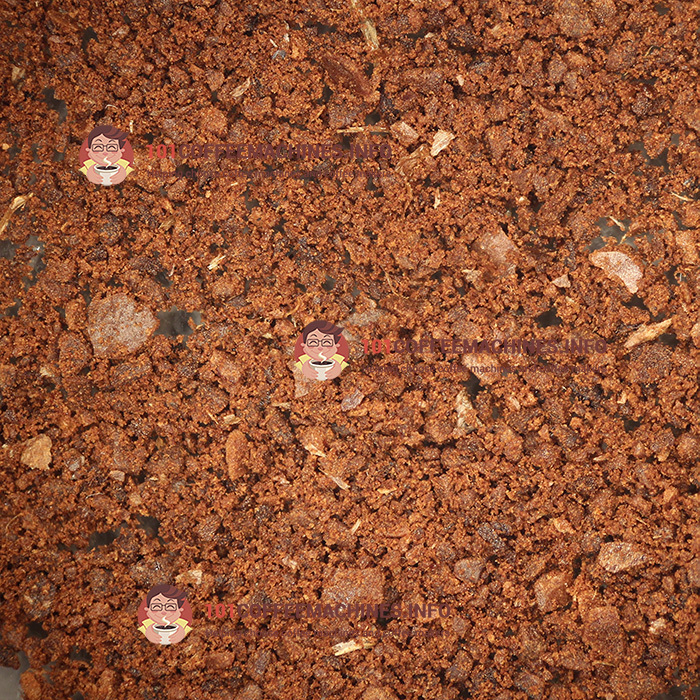 We also can measure the size now – biggest fractions of finest grind level on the blade coffee grinder is about 2-3 mm. In case of fake burrs, we see much more uniform grind. 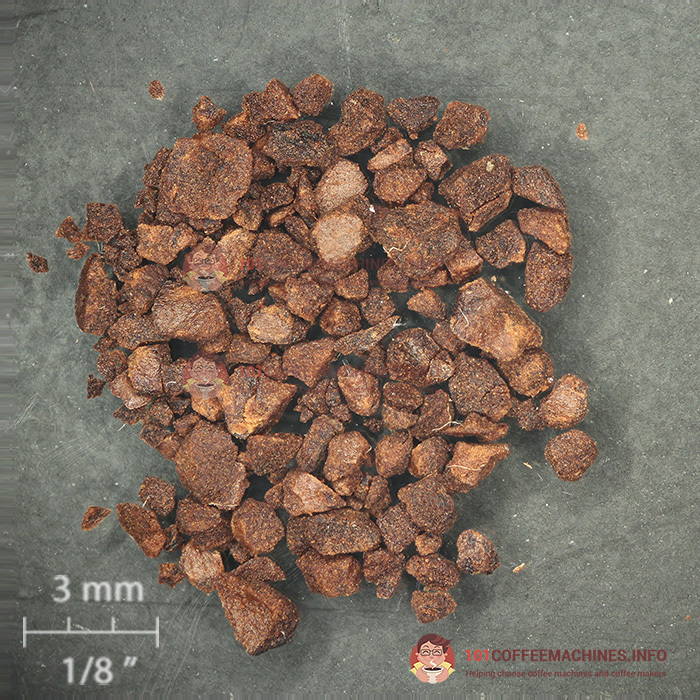 However, there are still a number of large (about 1 mm in width) chunks among powder. Their shape is more ’rounded’ compared to the blade coffee mill, but I still can notice flat chopped sides. 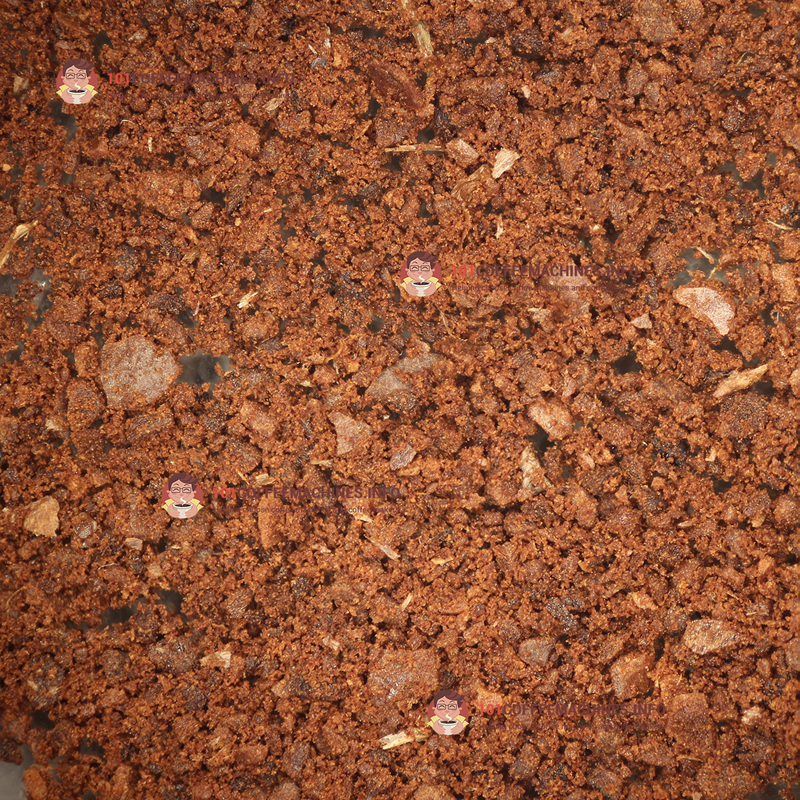 That’s the result of raised nubs on the surface area of the burrs, they still rather mash beans rather than grinds. Big differnce, right? 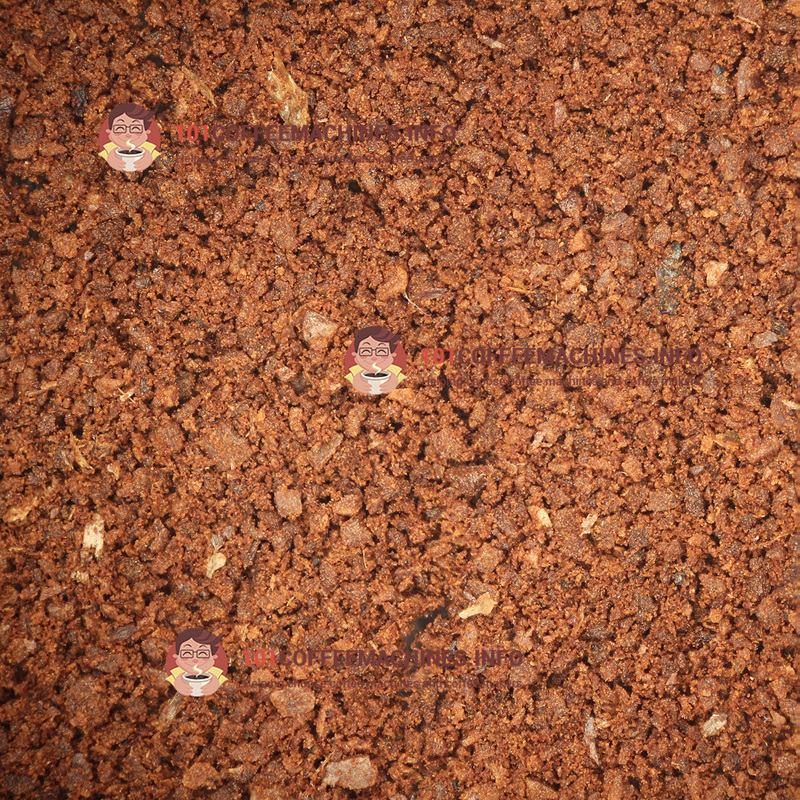 The grind is very uniform and the biggest particle’s size is only 0.5 mm. It feels very soft in hands by the way – probably because there is almost no sharp coreners, particles has complictaed shape. So you can see now that there is difference between fake burrs (or pseudo burrs or “bean mashers” like guy from Reddit calls it). And this classificaton of coffee grinders is not artifical, the different types of grinders show completly different results. 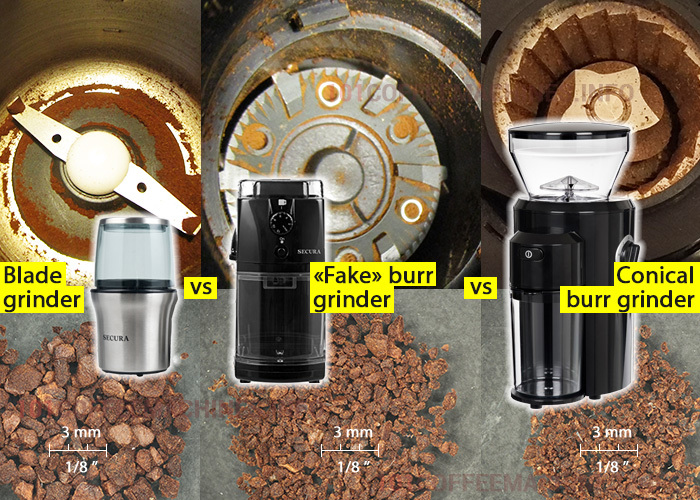 So you should not be confused: indeed, fake burrs grinders like Secura SCG-903B is much better than blade grinders, however they are as much worse than real burrs. I also run a short test with my daily driver Delonghi ECO311, a typical entry-level espresso machine with pressurized crema filters. I made an espresso shot using the same coffee beans ground on Secura’s blade grinder and on both variations of burrs. 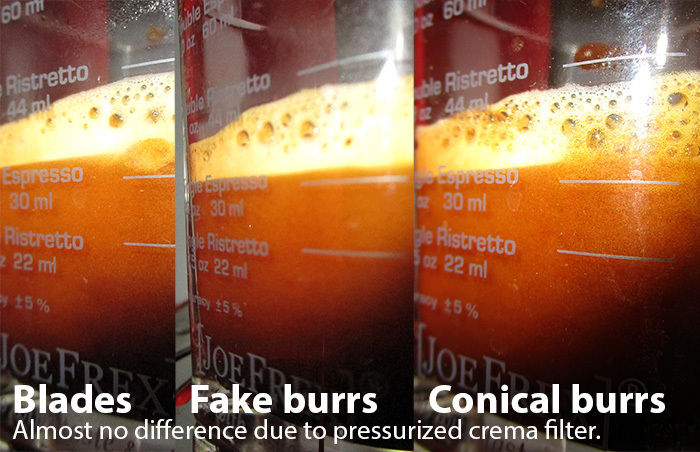 As I mentioned in my review of Saeco Poemia, pressurized crema filters are installed on the majority of modern entry-level espresso makers, they create fake crema. Delonghi ECO311 is not an exception that’s why you see just a slight difference. Blade grinder gives more bitter, flat taste. Also espresso shot was hotter than other – that’s because it’s hard to tamper ununiform grind and the hot water go faster through coffee. Fake burrs is still bitter, however it’s there more oils in the shot, temperature is lower. The taste is a bit stronger, but I can’t call it “full bodied”. Conical burrs gives definetly more acidity, now I can say that it has full body, however it’s still differs from the espresso in the local coffee shop (where the same beans are used). And also I can slightly feel seconadary tastes, I mean all those “slight flavor of pine” or “fruity aftertastes” that coffee manufacturers like to write on bean packs. As I explained above Secura SP7412 as any blade grinder could make an uniform grind only on extra fine grind level. The coarser grind you try to make the worst uniformity you will get on this grinder. And that’s the main problem of blades. If you a coffee snob I would recommend this grinder only for turkish coffee (where extra fine grind is needed). If you are not so into coffee SP7412 would be OK for brewing methods where fine grind is used (espresso/moka pot). However you should understand that the result would be far from perfect and probably it’s easier to buy ground coffee at a supermarket. This grinder is not suitable at all for medium and coarse grinding (filter/drip coffee, alternative methods). However this Secura grinder has a second function – the second bowl has different blade set which is designed to chop nuts, spices, even garlic or any other food you want to chop. 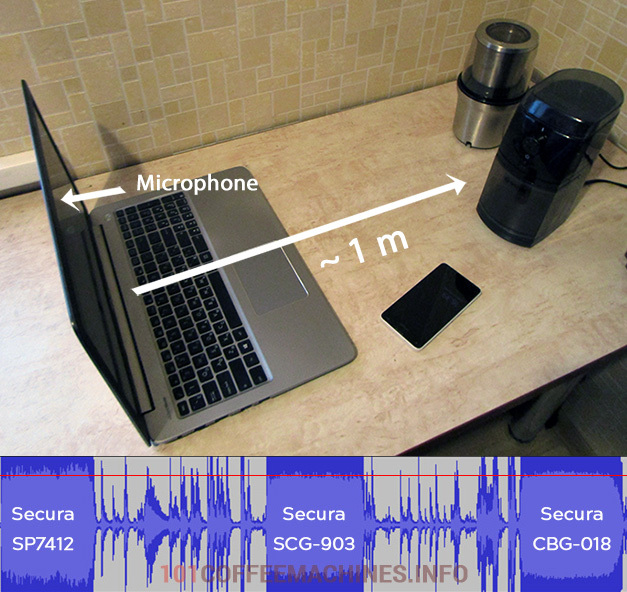 I think that this device should be considered as a chopper, that’s what Secura SP7412 is good at. Coffee grinding is just a secondary function with average results. Coffee powder falls on the bottom part when you change bowls. And the bottom part could not be washed. Secura SCG-903 is a minimal suitable coffee grinder for real espresso, one of the best affordable coffee grinders for espresso. There is a lack of grinding settings (I would like the finest one to make even smaller particles) and grind is still have poor uniformity and consistency, however it’s a huge level-up if comapred to blade grinders. If you have a simple coffee maker (under $300) then such grinder will be enough to get average espresso short. But there would be still a noticable difference between your espresso and espresso from local coffee shop with professional equipment. This grinder is also OK for coarser grinding (chemex, hario, cold brew, filter coffee), despite some some coffee connoisseurs who would say that coarse and extra-coarse grind isn’t uniform enough to make decetnt coffee. I think that if you are not a coffee snob it would be enough both for espresso and filter coffee if you will go with Secura SCG-903. Secura SCG-903B has one more pro – it’s the most popular one among these clones. That’s why it’s easier to buy replacment parts for it. For example, coffee ground bin could break if it will fall on the stone floor, and the new bin is sold on amazon. This one is choice almost without compromises for espresso drinkers. Secura Conical Burrs give fine uniform grinding. I would like to have more grinding level adjustments (it has 12), however for the price CBG-018 I could not complain. It is also very easy to fill portafilter with ground coffee because there are special round cuts on the top of the coffee bin. They have the same diameter as portafilters of Delonghi, Saeco, Gaggia, Krups and other popular at-home espresso makers (not professional size). So you can fix the holder on the top of the coffee bin and flip it over to fill the basket. I tried to grind straight to the basket but without success. There are enough space to place holder instead coffee bin (so that filter will be located exactly under the exit of the grinder – see photos below), however there is special switch button that controls that bin is installed. If not – the grinder will not work. I tried different methods to fool this no-bin detector but I failed. Finally if you prefer filter coffee, chemex or aeropress – that’s grinder also suitable. It gives good (but not perfect) uniformness even on coarser settings. As I mentioned above, getting a coarse and uniform grind is always the hardest. So if you are really coffee geek and want to make medium or coarse grind you probably should buy more expansive grinder. Once you adjust the cup regulator you will get exactly the same amount of ground coffee every morning in one touch, grinder will stop automatically. However, remember that all grinders does not measure volume or weight of ground coffee or beans, they meausure time. If you change coffee beans, you probably need to change the settings – different beans take different time. Medium and coarse grind (for drip ot alternative brewing methods) is not perfectly uniform: OK for most people, but could be not good enought for real coffee lovers. The coffee bean container on top has flat floor. Sometimes when hopper is almost empty the beans do not glide into the grinder. There is one more reason why I choosed Secura to represent conical burr grinders tribe – I think it’s underrated. It is a real conial grinder, it shows good results (see microscope photos above) and has a reasonable price tag. Other bloggers usually write about Baratza Encore and Virtuoso, I also like Baratza more, however the price factor should be considered. Secura CBG-018 is not frequently listed in variuos “top coffee grinders” ratings. Probably because Secura brand is known for cheaper products. 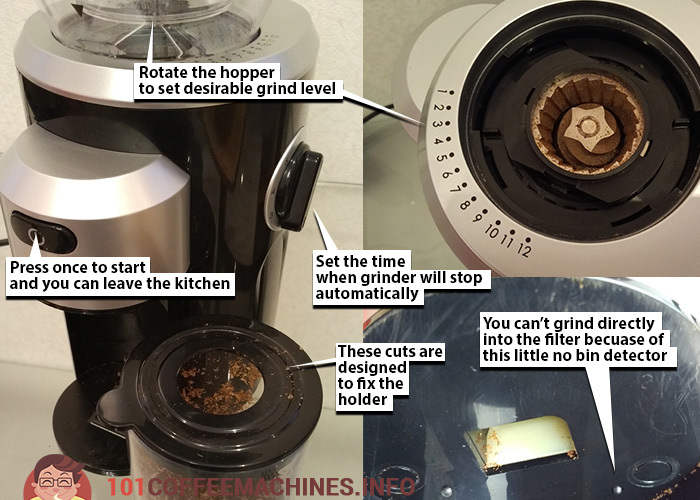 However it’s not the case of CBG-018 Burr Grinder. 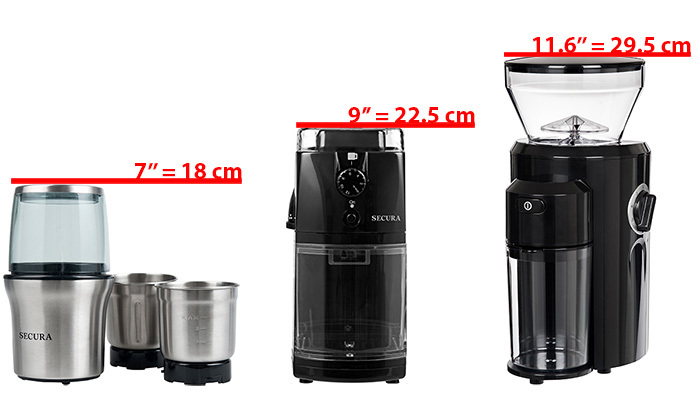 As I mentioned in the begining, Secura just orders existing coffee grinder models with different label. And the original grinder is Rommelsbacher EKM 300 (not sold in USA, here is the link to amazon.co.uk), which is good known in Europe as the reliable and cheap grinder. Finally: which coffee grinder to choose? Blade coffee grinders like the Secura SP7412 is only good for Turkish coffee. If you are very NOT into the coffee, you could try to use it for steam espresso machine, pumo espresso maker or for moka pot. However this would be a choice full of compromises. Probably it’s better to buy ground coffee. Fake flat disk burr grinder like the Secura SCG-903B is a minimal suitable coffee grinder for real espresso if you are short on budget. However there would be still huge difference between your espresso and espresso from coffee shop. It’s not suitable for cold brew (extra coarse grind), french press (coarse). You can try to use it for chemex , drip or pourover, but the result would be far from ideal. For moka pot this grinder will be almost ideal. 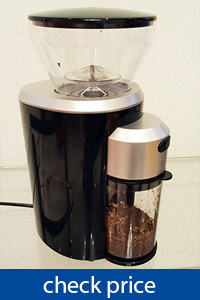 Real conical burrs like on the Secura Automatic Conical Burr Coffee Grinder CBG-018 are perfect for espresso if you are using pump espresso maker under $200 (any Saeco or Delonghi, Gaggia Gran, Hamilton Beach etc – see my comparative review of these coffee makers). With some experience you would be able to make good espresso shot, almost like in the coffee shop. 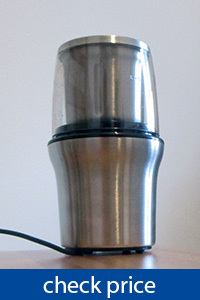 Conical grinders of such class is also suitable for any other brewing methods. However, if you are real coffee snob and prefer french press, drip or cold brew Secura CBG-018 could be not good enough for you. What about the Graef grinders? They have this option to put your portafilter directly under the grinder which looks great to me for the exact amount of fresh coffee? I am considering EC685 + CM800 eventually. Does it sound like a reasonable combi? Graef Cm800 is a good grinder, with enough grind level settings. Anyhow, for EC685 (if you are not considering switching to unpessurized filter basket in future) it could be even “too much”. So it depends on the price. There are entry level real burr grinder (with few grind settings: Rommelsbacher EKM300, Solis Scala in Europe) – in my opinion they are the best pair for EC685 with a standard pressurized filter (if considering the price). However, if you don’t need to overpay much for the CM800 in your country (or similar: real burrs + many grind levels) then CM800+EC685 is a good setup as well. you do not need the cm 800 , the cm 702 costs abaout 90-100 euros ,and it´s a good grinder. I am thinking of buying the EC685, can get a deal along with the KG521 Grinder. is this grinder any good? Yes, the KG521 is a good grinder for its price. With real burr set. not fake. Description says it has 18 grind settings vs 12 and name is 903B. Do you know hwthere its different or its the same one as CBG-018. Thank you. They both have stepless grind level regulators, thus, the amount of grind settings technically is unlimited. However, for espresso, for moka pot you usually need only the finest one and several pre-finest. That’s why usually it’s not very important how many coarse setting you have. 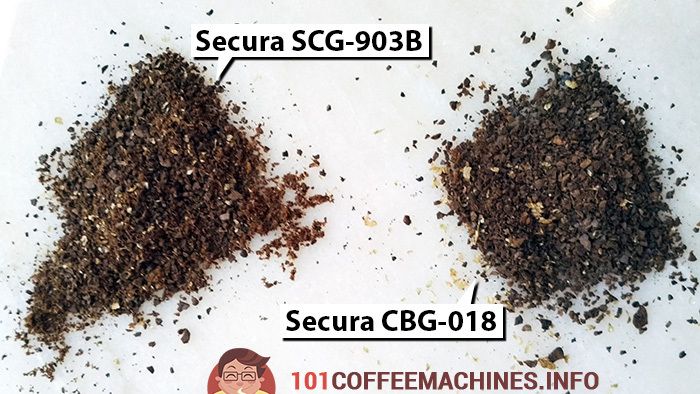 What is important, is that Secura CBG-018 grinds finer on the minimum level if compared to SCG-903B.